Pat as you know I have done quite a bit of drag racing with various stock and modified arms. The blue tip or so called drag arm came in several dragsters I originally had in the 70s. I have never found them to be quite as good as the mean green arms in general. Mean greens vary quite a bit and normally ohm out at about 5.7-5.9 ohm. The blue tips are right around 7 ohms. Normally the mean green is a better choice. My quickest and fastest mean green pancake car, (the one that is on top of the Nitro slots top 10 list), with ceramic motor magnets will beat any out of the box production inline. Granted it is an exception and the average car built the same way is about a tenth of a second and 8 mph slower in 15.5'. Some pancake AFX and T jet chassis car really fly if you know what to do to them. Last edited by Dave632; 09-22-2018, 08:51 PM. Dave, I think you're confused. The drag armatures were blue tipped. They could be found with green and then gold wire. Might want to edit your post. It's how weird misinformation rumors start. As for your hyper-fast Mean Green, I suspect this Red Devil would be in a similar situation. I must have at least 200 well set up Magna-Tractions with 5 different armature types, and it's probably the fastest one with stock magnets. Blue tip is right. Memory not so hot any more. Yes Dave,you got to love them "exception" cars. I have a few that way which came straight from the box fast. Lucked out and built a few more with a right combo of parts. I can't say I am experienced enough to pull a perfect build off every time. But I have taught myself what does not work with experiments in trial and error. So I guess you could say,I know how not to build them! About a month or two ago I was really down on myself with some absolute debacles. What should have been some classic nice builds totally failed. I got zonked good! But I figured it out where brand new parts just would not work for what I was doing. It did take lots of head scratching on about 3 cars. On the test bench they worked fine with a power pack then on the track they were failures. It was a definite WTF moment? By putting my head to the grind stone and my face down on the rails I figured it all out. A test piece of track at eye level sorted the rest out and was immensely invaluable! I cataloged it all with pics and started a draft of my problems just to blow off some steam. With a couple more additions I will finish it soon and post it here for others to learn from my mistakes and have a good laugh. When you see a post titled "Fatigue and Failure" that's the one. On the bright side of things I guess I will be seeing you soon at the Bear Creek Nationals. I mailed my cars out yesterday. I almost had to abdicate my DR1 chassis due to Jeff's muscle car/tuner requirements. I had never given it much thought when I signed up. However I found out in my search for an appropriate 4 gear body I had neither of those type bodies. All of my newer AW stuff is Funny Cars cause that's what I like. I did have a Cadillac Hearse which is huge and I was not really sure if that would meet the requirements? The only other thing was a Grand AM Funny Car which does not look so Funny since it has no motor sticking out the hood. I surely did not want to get disqualified over a stupid technicality! So I started searching through my shelf queens of original Specialty AFX cars. Well the Peace Tank and the VW Thing were not canidates either. So it looked like I was going to have to use the Woody or Model A which are flying bricks. Plus I was really not comfortable with those fragile nose grilles and headlights slamming into a pillow block at shutdown. 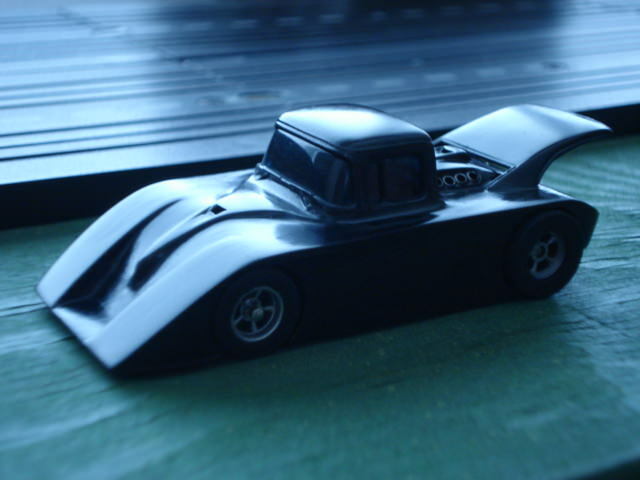 I did luck out when I remembered having a AW Nomad body sitting on my track. I never used it and thought it was just an X-trac body like the original AFX one. However I looked and it is much bigger that with the DR-1 wheels placed all the way back it will fit. So that's my close call story of almost not making the race. I took that 440 Lambo I entered at your last race and switched it to a Corvette body. I also had to change the shoes to non braid for the event rules. Not sure how fast it will be without those now? Just put together an old t jet chassis with a bunch of mods I do to them to make them run a lot better. Left out the braid just to try it and it was pretty slow running .95 @ 13 mph. Put the braid on and it ran a .68 @ 22 mph which is like night and day. Most of the time the braid does not make that kind of difference but this time it worked miracles. For the upcoming Bear Creek race I was able to get the DR chassis running close to the braid times without it. Good luck at the upcoming race. I don't think Jeff will be that critical about what type of body you use at his race. The body rules are suggestions. That is what I do at my races I suggest a body type but if you send in a submarine I will still let you run. Lets not get to crazy with rules. I had a problem at one race, a long time ago, where some idiot complained that a guide pin had been moved. That is total stupidity and idiotic in my opinion. Something that makes NO difference in performance should not be an issue at any time. I here you brother about the guide pin complaint. Totally stupid! Now if it was a road race or a sanctioned road race event I could understand that. But not for the drag races though. You did a really good job on that DR1 chassis for me so that's why I entered it. Since it did not get braids I am hoping for good results along your test figures. I did not know how strict Jeff was compared to your races which I have ran? I figured it was time to branch out and I wanted to run another race now before your next event. I need to get something better together for the pancake events and maybe even that PSO list. Is the rules no rewinds and a readily available arm? Or can you use rewinds as long as they are not balanced and advanced timed? Of course staying within ohm rule limit. Dammed the torpedoes, full speed ahead. I love shoe voodoo. In the way back, the Super ll Tiger Tails enjoyed some hyperbolic acclaim that still carries over to today. The simple fact was that by adding the monstrously tall AJ's front hubs, someone left the pick up shoe "hangle" short. Coincidentally, about the thickness of a Tiger Tail. Wink wink. Those mondo AJ fronts were not intended for short shoe travel designs like the AFX, and tended to leave the contact patch up on tippy toes if employed without the TT's. The AJ's worked on pan chassis, which used the high goose neck style swivel guide hanger. Certainly braids have many desirable properties. In most cases, tuning affects arent singular, rather there is always more than one thing going on; especially given the unique geometry of the system in question. Frequently over-looked, but not the least of which; is acting as a spacer/shim when installed on a hard shoe. Consider how that additional material affects the springing, as well as pushing the travel window from middling, to it's upper reaches. A set up that is a bit light in general, will benefit from the "tightening up" that the added material to the contact patch creates. The critical point is that the upper limit of the hanger window is not exceeded. All that said, almost 10 mph is pretty miraculous, so I'm wondering if the initial setting was a bit light? ... and could some of that exorbitant mph differential be picked up by altering the fulcrum point, via shoe hook adjustment, to increase the tension; rather than attributing it all to braids ...? Just spitballing my curiosity Dave, and playing Devil's advocate. Last edited by model murdering; 09-23-2018, 01:14 PM. AH ha,Mr Bill is in the house. You sure have some good Tiger Tales! Pleasure to have you around MM. Since you always are sort of a Mystic,you most have subliminally known that this subject is one that caused me problems and is noted in my "Fatigue & Failure" draft. 10 MPH IS a huge difference. I put this chassis together from a bunch of parts I had. It was a bare chassis. I did NOT play with the springs or shoe contact before adding the braid. I am sure I could have made it run better than it did without the braid. I just sent in a couple of cars to Jeff's race in Texas where braid was not allowed. After removing the braid from the cars I was able to get the performance within .01 and 1 mph of the times with the braid. Different chassis will not all react the same to the addition of braid. In some cases it is like adding nitrous to your full size car. In others not to much effect. On BSRT G3 cars the effect is minimal. Dave: " After removing the braid from the cars I was able to get the performance within .01 and 1 mph of the times with the braid . Different chassis will not all react the same to the addition of braid." It's been a few times now I found a potentially great car stunted by something unexpected and quite invisible in the shoe area. A slight readjustment or a spring too strong or weak. They'll run like a bandit when you hold the wheels up, but duds when on the track. First I want to say I only drag race and do not road race at all. I am only interested in power and low speed torque. Results may be different from a road racing perspective. Pat, old stock T jet tri color arms read in the 20 ohm range, they are OK to run but they are very slow. Many bad arms I have seen read lower in ohms than the normal stock reading. That is because the windings start to short together therefore lowering the reading. Rarely does a winding open in my experience but it can happen, usually the wire going to the commutator is broken off. I have also seen the windings going up in value many times. All I can figure there is that the wire gets hot and changes its resistance value. Resistance value varies and in my opinion having them vary some pole to pole is not to critical. I to have had varied results with different mean green armatures. As and example with a mean greens where most of them read in the 5.7-5.9 range I have seen as high as 6.1 and as low as 5.6 but that is the limit of all I have tested which would probably be over a 100. I have had some good results with some red tip or 14 ohm armatures, but best vs best there is no contest between the 2, the mean green is better. Remember Aurora/AFX made a drag arm that read about 7.0, which I believe was blue in color. In my experience balancing is not that critical. I have balanced many of the pancake armatures with little improvement ever seen with any of them. Maybe they were not out enough to make a difference. Matching motor magnets to the armature is very important. To weak or to strong will give bad results. If you really want to go fast you generally have to try several armatures in the same chassis. In the case of my record holding 57 Chevy Nomad it was the best out of about 30. Trying different strength magnets help, even among stockers there is a gauss range of 100-300. The strongest is not always the fastest however which really can confuse you. Mean Green. When they're good, they're SO good. But, I find them all over the map. Many that spin up great wheels-up just don't have enough "umph" to get the car up to speed. Lack of torque accentuates any imperfections in balance or timing. Stronger magnets usually help. The late AFX just-before-Magna-Traction red and white magnets were a great help from the factory for that chassis. They are way stronger than the green/red and light blue/red combos that came before. Of course many of you are using them in the Thunderjet chassis, possibly with lower gearing. My testing is limited to AFX and AFX Magna-Traction, a heavier car with generally fixed gearing. My consistently fastest AFX and AFX MT cars have higher resistance Thunderjet and Red Devil armatures. In most cases, one of these with a Thunderjet armature is something I acquired that way, so someone who knows more than I do put it in. MT armatures (I find) are a little more consistent, maybe owing to stronger magnets or overall better torque, with a few standouts, many of those standouts being late production. I find fiddling with brush tension can get most of them up to reasonable performance. When an MT armature is a dud though, it's obvious. - Tuff Ones with the huge drive pinion. The torque-shy armature can't spin it up. They'd have been better off if they'd left the gearing alone. - AFX. As above. Not supplying the cars with enough power to eek out low-resistance advantage. Again, as often as not, I find higher ohm armatures I have in some of these cars are among the better performers, Thunderjet, Red Devil/MT, JL/AW, peppered in are a few Mean Greens. I think Aurora should have stayed with the 14+ ohm armatures. I wonder how many kids were disappointed at Christmas when one of their two new AFX set cars was way faster than the other. Last edited by JimDouglasJr; 01-29-2019, 11:12 AM.